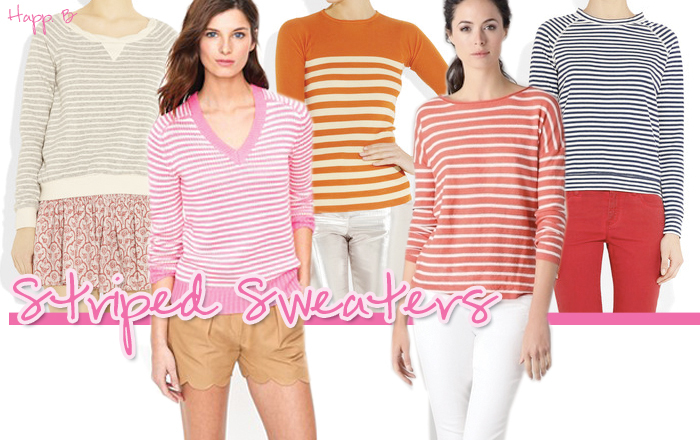 When I began writing this post, it was going to be a collection of great spring sweaters. Three sweaters in, I realized they all had stripes. I’ve written about my love of stripes in the past, but I finally succumbed to the fact that I may have an addiction. There’s a bit in the TV show Happy Endings (fabulous, hilarious, watch if you aren’t) where the character Dave is given a V-neck intervention. Friends, you are welcome to begin my stripe-obsession-intervention.